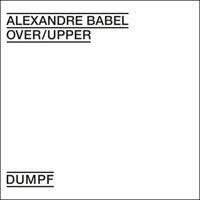 The latest vinyl edition from the DUMPF label out of Zurich, Switzerland is also the first-ever release from Swiss born and Berlin based drummer, percussionist and composer, Alexandre Babel. Reared on such musical forms as modern classical, free improv and noise, Babel is also a member of the contemporary chamber music ensemble KNM-Berlin, and other outfits such as WZC, Fosil and Radial. As if all of that were not enough, he’s also the artistic director of the swiss-based percussion group, Eklekto. Following a long tradition of such avant-garde percussion pieces as Edgard Varese’s “Ionisation” and Karlheinz Stockhausen’s “Kontakte,” side one of the Over/Upper LP opens with a really quiet, high-pitched static drone that meanders on for quite a while until it eventually gets pierced by some reverberant percussion pings (courtesy of a small electro-motor) and electronic noise outbursts, plus drum, cymbal and gong hits that sound really spare. About halfway through the piece, Babel launches into a raging free drum solo that lasts all the way to the run out grooves. On the flip, another really low-level ice drone gets punctured by occasional loud drum and percussion outbursts, which gives way to a couple of more climactic solos. Oh, and another array of quiet clatter gets thrown in there somewhere. So, basically, when it comes to composition, Babel likes to turn it up to 11, then turn it down to minus 11 and back again in a loud / quiet / loud dynamic. It’s all good. Fans of Max Neuhaus’ Electronics & Percussion LP should have no problem with this. You are currently browsing the Arcane Candy weblog archives for April, 2015.